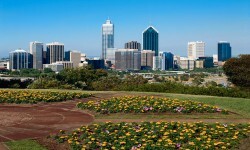 Perth is the capital and largest city of the Australian state of Western Australia, and the fourth-largest city in Australia. The central business district of Perth is bounded by the Swan River to the south and east, with Kings Park on the western end, while the railway lines form a northern border. Perth city centre bustles with activity and offers a range of choices for shopping. Just a short ferry ride from Perth or Fremantle is Rottnest Island - a popular holiday destination. Just outside the Perth city centre is the Perth district of Northbridge where you will find a range of nightclubs, pubs, cafes and eateries. Locations of interest around Perth: Fremantle, Rottnest Island, Darling Scarp, Swan River, Canning Rivers, Serpentine River, Murray River, Mandurah, Kalgoorlie.